By draka, March 17, 2018 in Community Talk: Tickets, Meetups, etc. 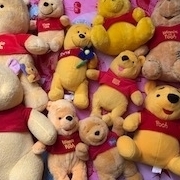 Photos of yhe Pooh exhibition at Bunkamura. Looks lovely. Practice Tickets Start Selling on 15 Feb at 12:00 JST. It's first come first serve and no designated seating (means camp out for best rink-side seat?). ETA: And it seems there will be separate tickets for Main and Practice rinks. This is gonna be crazy! The problems is we still don't know which rink will Yuzu appear and I don't think I can afford all of them. So anyone have any advice on which Day and rink to choose first? Definitely a good idea to split up and buy tickets For different days. Ughhhh. It’s so expensive. As expected. The only choice to make is on the 18th and 19th. Other days there are only tickets for the practice rink. I have no idea, tbh. I’ve never been to a comp with open practices. We need to strategize. During Worlds last year the first day of practices there was almost no one there. So I guess the safest bet would be foe the 19th onwards. Other satellites who're more experienced with these things might have a better idea though. Does anyone attend Helsinki 2017 remember which day he practice? Now I'm worried about the ticket bots, and a whole slew of practice ticketa flooding the ticket resale websites. It’s going to happen. Just pray for foreign sale. Pretty sure he was there all days! He always comes to all practices at competitions, far as I remember. Would he go to more than one practice a day? I think there’ll be morning practice in one rink and evening practice in the other. I guess we’ll just have to try to buy tickets to both?